Frankly, luxury photo bags give us the creeps. If they don't scream, "Steal me!" they at least whisper, "Look at me!" So we've steadfastly avoided them. And that has included Think Tank Photo's Signature series. Signature 13. Gorgeous and functional, both. Since its introduction the Signature series has been praised for its luxurious design. It's the first thing you hear about it. And, frankly again, it deserves the applause. But what finally got us to investigate this handsome bag was the combination of gear you could pack in a bag that would fit under the seat in front of you. 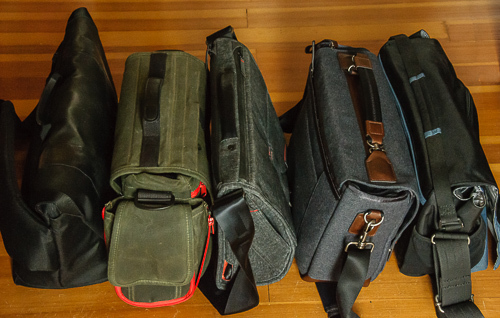 What we'd like to see is a small roller bag large enough for a body, lens (or two) and strobe with a pocket for a sleeved 13-inch laptop or tablet that would fit under the seat (or most seats, since there's no standard there) in front of you. Could this be the ticket? 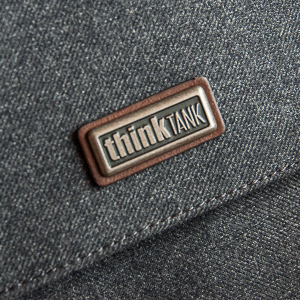 Think Tank Photo sent us a Signature 13 in slate gray to see for ourselves. The Signature series, launched in February, includes two sizes: the Signature 10 and the Signature 13. 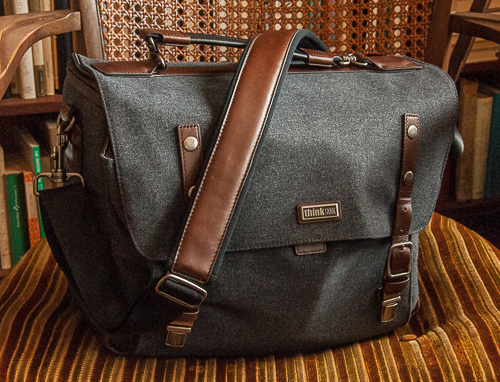 The smaller $249 Signature 10 bag can carry a dSLR or mirrorless system with three to four primes and accessories plus a 10-inch tablet. The larger $279 Signature 13 bag can carry a dSLR with mid-range zoom attached plus two to three additional lenses and a 13-inch laptop. Both sizes come in two colors: a dark slate gray or a light olive green. The series distinguishes itself by the use a wool-like fabric, leather detailing and metal hardware. The fabric is actually a nylon polyester texturized blend. It's soft to the touch but durable and resistent to weather. The series, however, also includes a rain cover. Luxury Looks. Mouse over or tap for captions. 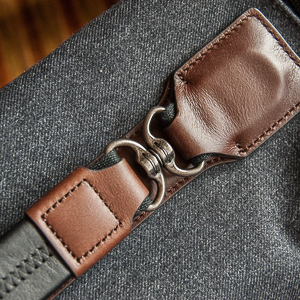 Leather is used for all the straps, handles, zipper pulls and most fasteners, including a clever leather button to hold the interior flap open when you open the outside flap. The stitching is first class, too, a pleasure just to look at. There is even a leather bottom to protect the bag from a damp sidewalk, say. Metal hardware gives us the willies. It can scratch. And the two buckles on the Signature's flap can fly out a lot further than you think, with at least one of them hitting something. We're also not fans of bucket latches. But these are surprisingly efficient. Just push down and up and they release. You can do it with one hand, in fact. And having two of them on a full bag instead of the single latch on most bags seemed more secure. All the metal hardware is serious stuff, though. The top handle has a double swivel attachment and the strap, lined with leather itself and featuring a neoprene non-slip side, has heavy-duty hooks that clip to D rings anchored to the bag with leather patches reinforced on the inside. 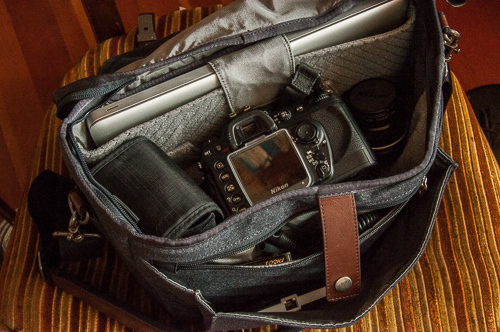 The real test of a bag isn't how nice it looks but how well it organizes your gear. Is there a place for everything you need to bring with you? Can you get to it without removing other things? Is it secure? Is it protected? The Signature series does well on all that, too. On the back of the bag, there's a zippered document pocket to make it easy to get to your travel documents like tickets and passport. It's full width, large enough to fit a manila folder, but it isn't very expandable so even fitting a magazine would be a challenge, especially with a full interior. And just to prove the bag was meant to travel, there's a handle pass-through for rolling luggage. You can often simulate a pass-through with straps or bungie cords but when you're rolling thousands of dollars through strange places, having the security of a pass-through is a welcome advantage. There are no pockets on the sides, nor any way to attach a small accessory bag. 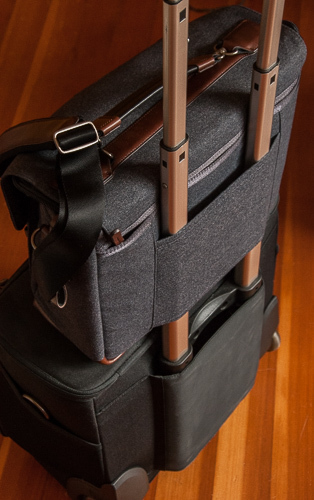 The Signature series isn't designed to be expandable in the way the Domke bags are. 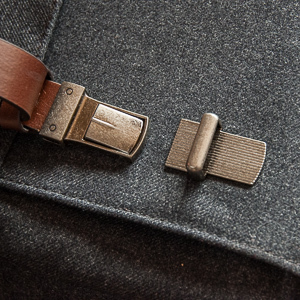 The pleated front pocket has two snaps with a leather strap to provide for expansion. If you do expand the pocket, you'll also have to expand the cover flaps leather straps so they'll reach their latches. In the corner of the inside pocket is a flap to fit a large smartphone. Inside the front pocket is a zippered interior pocket with sewn in dividers for pens, cards and smaller items that might get lost in the bigger pocket. There isn't much play inside, so it can be difficult to pack bulkier items like a charger in here. But we really miss bags that skip dividers like these. Handle Pass-Through. Nothing like it. 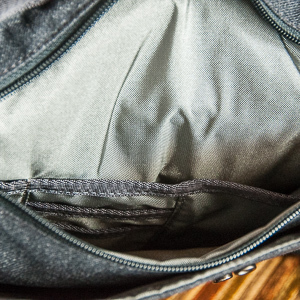 The front pocket can get a little squeezed if your main compartment is stuffed. Even just using the included dividers seemed to restrict the front pocket a bit too much for us. Part of the problem is that only the sides are pleated. The bottom does not expand, so you're working with a V-shaped compartment rather than a U-shaped one. A big mouth with a small stomach, in short. The main compartment has two sections covered by a zippered top that can be attached by a button to the main flap so it opens automatically. The zippered top also forms a bellows so it can expand over tall times in main compartment. 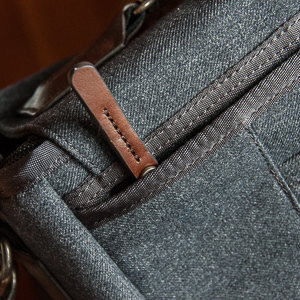 Along the back side of the main compartment is a wide pocket large enough for our 2011 13-inch MacBook Pro. A Velcro flap secures your laptop in the pocket. 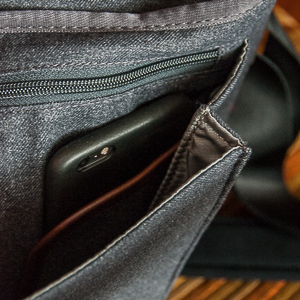 Inside that pocket is a sleeve with a nine-inch opening for a tablet. The interior of the main compartment is quilted to grab the supplied two large folding dividers and three smaller dividers. It isn't likely you'll use all of these in such a compact compartment, although the two big ones seem essential for positioning a camera. You'll also find the rain cover in the main compartment, which is where the shoulder strap ships, too. The bottom of the interior is protected with two more dividers that cushion your gear from whatever the bag rests on. We had to reposition these to get our laptop to fit all the way into its pocket. Having a place for everything doesn't mean you actually have room for everything. In that regard we found the Signature 13 came up a little short for our commute and travel packing. Packed. Everything in our commute list. The commute list wasn't a problem. We even managed to include an SB-800 strobe in there and still had room. Inside Story. Our commute list packed. To get the travel items in, we'd probably leave the flash behind. And perhaps the prime, too. 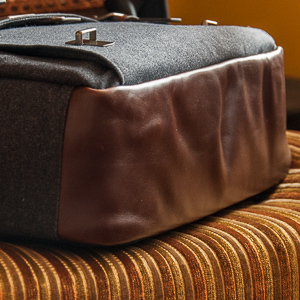 Our sense of things after packing the bag a few times was that it would accommodate essentials but if you were looking for a nook to slip your glasses case in or a paperback, you'd be out of luck. 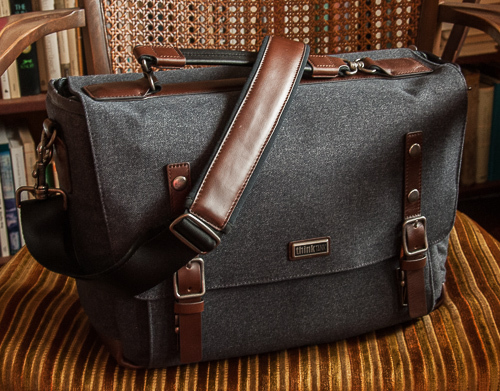 The big advantage of a 13-inch bag over a smaller bag like the Domke Crosstown Courier which we use almost like man purse is that you can bring your laptop along. Top View. City Walker, Signature, Messenger, Domke, Traffic. Side View. Traffic, Domke, Messenger, Signature, City Walker. That isn't true of the City Walker, which is slightly narrower than the other bags and does not have a cushioned computer compartment. So off the island with that one. The Domke Herald, despite its apparent width, doesn't have much depth in its main compartment so we have to remove the lens from the camera body. And even then, there's no computer compartment. So it's voted off the island, too. The Traffic is the cheapest bag and that's also it's main benefit. It's a tough call, though, between the Signature 13 and the Everyday Messenger. They're both well-made and nicely-designed bags that hold about the same amount of gear just as conveniently and safely. 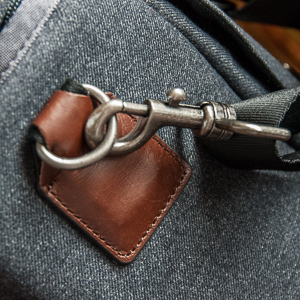 We like small touches on the Everyday Messenger like its unique front latch but miss other things like a luggage handle pass-through. The Signature 13 seemed to take our computer and camera gear a little more easily but didn't have the extra space for small items. Bags are impossibly imperfect. But the trend is promising. 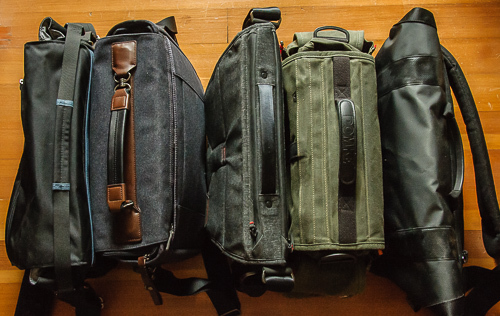 We're seeing some bags we can actually live with from Domke, Peak Design and Think Tank Photo. What we like about the Signature 13 outweighs any inconveniences. It's attactive (which may not be an advantage when you travel), compact (which is), yet holds both computer and camera gear. It falls a little short on including all the peripherals you might need (like small routers and external drives) but you can make it work. 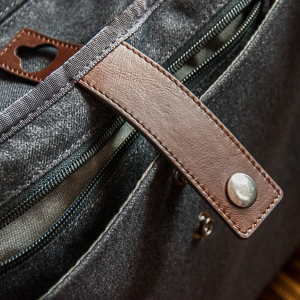 The Signature 13 deserves all four photo corners, a worthy contender for your commute and travel bag. OMG I need this in my life -- whyyyy is it $300? Oh, now you're exaggerating. It's only $279. And if you don't need to lug a laptop around, you can do the $249 version. Or you could browse through the company's other cleverly designed shoulder bags. But you probably won't find a better deal.